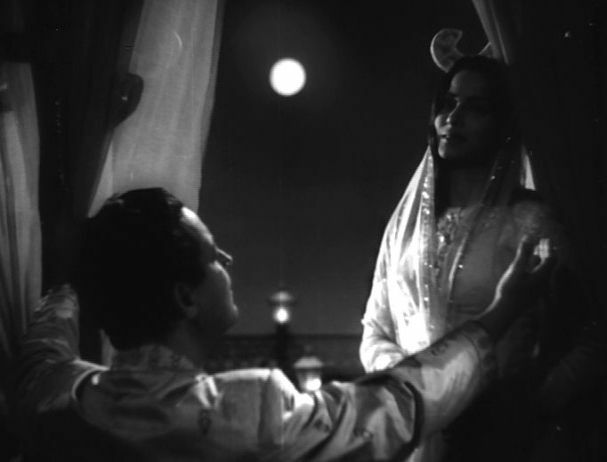 Chaudhvin Ka Chand (English meaning: “Full Moon”, 1960) was one of a string of great films produced by renowned Indian producer/director/actor Guru Dutt (Vasanth Kumar Shivashankar Padukone). It was released less than nine months after Dutt’s now-famous Kaagaz Ke Phool (1959), which at the time was such a commercial and critical disaster that it ended Dutt’s career as a film director. With Chaudhvin Ka Chand, however, Dutt, still in the roles of producer and lead actor, came back with a big hit that reestablished his reputation. From today’s perspective, I would say that this film does not contain the searing expressionism characteristic of Dutt’s greatest films, like Pyaasa (1957) and Kaagaz Ke Phool – it is much lighter in weight, which perhaps accounts for why it went down better with the public at the time. Nevertheless, there are some virtues and interesting characteristics of Chaudhvin Ka Chand that make it still worth watching today. One of the interesting aspects of the film is its socially contextual subject matter. Set in Lucknow, in the midst of its substantial and cultured Muslim sector of society, the film can be considered what in Indian genre parlance is termed a “Muslim social”. In this case it rather deftly takes on some social matters with generally light-hearted brush strokes. In particular, a primary theme of the film concerns purdah, the South Asian Muslim practice of restricting women from interacting with any men apart from their own close family members. In this tradition, when women go out of their homes, they must wear burqas and face veils that keep them completely covered from view. Of course in such circumstances, young men are often interested in getting glimpses of women’s faces behind those veils, but they often wind up with very limited information. This problem lies as the heart of Chaudhvin Ka Chand and eventually reaches farcical proportions. To achieve this in Chaudhvin Ka Chand, Dutt had much of his production partners again. This included cinematographer V. K. Murthy and screenwriter Abrar Alvi. 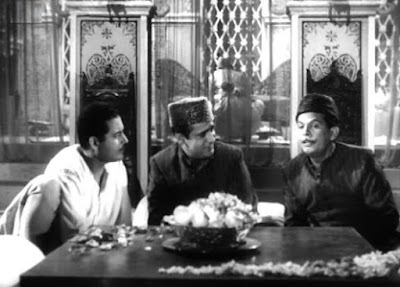 Partly in consideration of the “Muslim social” subject matter, Dutt recruited veteran Mohammed Sadiq to direct the film, although Dutt presumably had a strong influence in the film’s direction, as well. And, again, Dutt’s cast included two of his favorites, Waheeda Rehman and Johnny Walker (Badruddin Jamaluddin Kazi). Whether just from built-up experience or for some other reasons, I think their performances in this film were more natural and narratively engaged than in Dutt’s earlier films. Of particular note is the film’s music. Although Dutt's usual musical composer S. D. Burman had disconnected from Dutt after Kaagaz Ke Phool, Dutt hooked up with another outstanding composer in Ravi (Ravi Shankar Sharma, not the famous sitar player Ravi Shankar). To convey the Sufi-oriented qawwali music associated with Lucknow, Dutt used Urdu poet and lyricist Shakeel Badayuni. 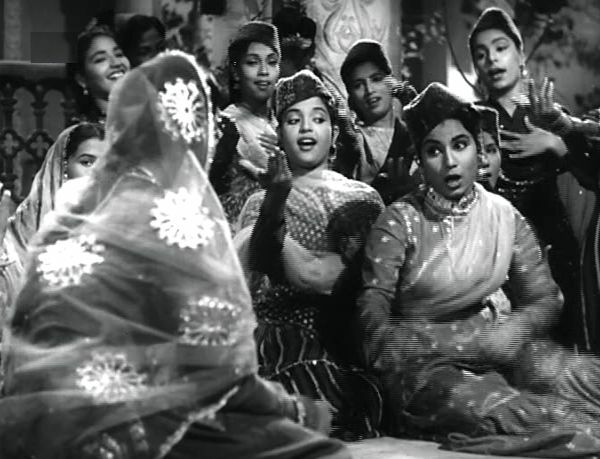 Together with the playback singers (Mohammad Rafi, Lata Mangeshkar, Geeta Dutt, and Asha Bhosle), they produced music that greatly enhanced the story and fit perfectly with it. In particular, I found the lyp-syncing to be outstanding – the best I have seen (and heard) in connection with Indian playback songs. The story of Chaudhvin Ka Chand concerns how the practice of purdah obscures and entangles two men friends who fall in love with the same woman. These things happen all the time in many contexts, and I find them invariably excruciatingly painful, because there is no possibility of a mutually satisfying resolution. Such anguish was only intensified in the honor-bound circumstances of upper-level Lucknow society. Male (or manly) Bonding (MB) and loyalty among close male friends. This is regarded in some quarters as a special virtue that defines a man’s character and sense of self. In this context women are viewed not as soul mates but as possessions that can even by traded in order to cement male bonding. Selfless Love (SL). This is the dissolution of self and the immersion in the beloved. At various points in the film, MB and SL are shown in high relief. With these elements in the background, the story progresses through six phases. Pyare Mohan (played by Rehman) is a wealthy young aristocrat and generally referred to with the honorific “Nawab” (I will use that reference in the following). Shaida (Johnny Walker) is the wayward son of a prominent police inspector. As usual with Johnny Walker roles, this outrageously effeminate character’s presence is primarily for comic relief. Aslam (Guru Dutt) is a young businessman whose parents have passed away. He was financially rescued by the Nawab and almost adopted into his privileged family. They are so closely tied by male bonding (MB) that Shaida at one point in the story refers to the three of them as one life in three bodies. Early on, Shaida and the Nawab are at a bazaar/fair, where women in attendance are completely covered in their burqas. By chance, however, the Nawab catches a brief glimpse of a momentarily uncovered young woman, Jamila (Waheeda Rehman) and becomes instantly infatuated. 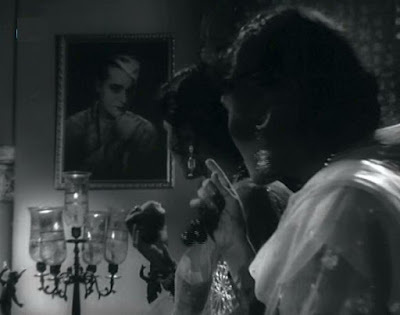 Later at an all-woman birthday party at the Nawab’s house for his sister, he spies on the young ladies from an adjacent room and notices with delight that his new beloved is in attendance. At the party the girls sing an engaging and meaningful song about how hejab-clad women are perpetually readjusting their veils, while interested men stealthily look on and yearn for more. An underlying theme to the song is that were it not for those onlookers, beauty itself would have no meaning. 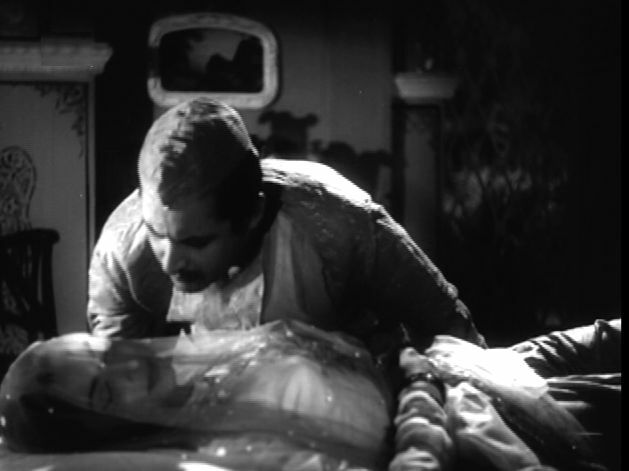 The Nawab’s friends (under MB pressure to help), as well as one of his maids, seek to find the identity of the girl he loves, but the first of a series of misidentifications in the film takes place. Since noone but the Nawab has caught a glimpse of her, the only evidence they have is a torn piece from the girl’s veil that the Nawab had picked up. The wrong girl is identified, and because of purdah, the Nawab’s only option is to send his emissaries (Aslam and Shaida) to the family to issue a marriage proposal. Up to this point the film has basically been a light-hearted farce. But now things get complicated. 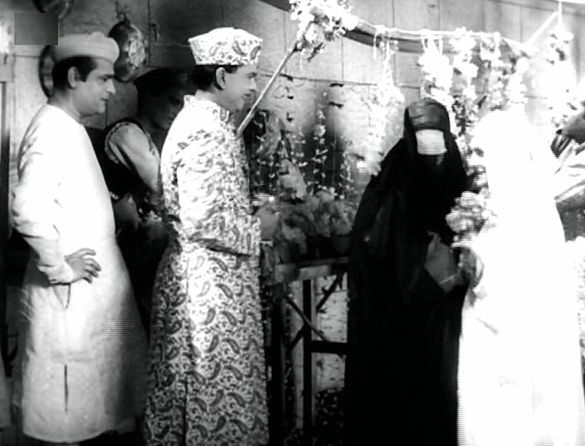 The Nawab’s mother has arranged for him to get married to a young woman that neither she nor the Nawab has seen. 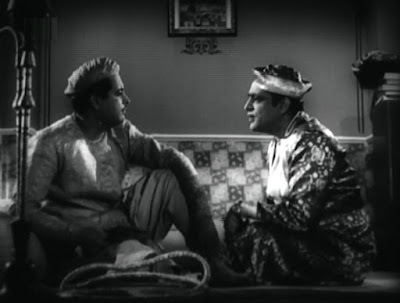 But, of course, the Nawab wants to marry the woman he saw in the bazaar, so he wants to get out of this arrangement. So he exerts his male-bonding (MB) pressure on Aslam to marry this yet-unseen girl that his mother has arranged for him. The viewer is probably not surprised that this woman turn out to be Jamila, the very girl that the Nawab pines for. At the wedding of Aslam and Jamila, the bride is completely covered, so one, including the Nawab, can identify as the girl the Nawab wants. Aslam is delighted with his bride, whom he only sees face-to-face after the ceremony. There is a memorable performance of the title song when the newly married couple are finnaly alone in the bedroom, and this is the highlight of the film. Meanwhile the Nawab learns that the girl Aslam and Shaida had earlier identified for him is the wrong one. Now there are more shenanigans in attempts to locate the right girl for the Nawab (even though we know that the one he wants is at home with Aslam). Shaida dresses up as a bearded beggar and goes to the bazaar to find the woman, but again a mistake is made. This time they wind up thinking that Aslam’s sister is the girl the Nawab wants. Meanwhile we see that the naughty Shaida is in love with a nautch girl, Tameezan (Minoo Mumtaz) who sings, dances, and gives favors for a price. Aslam is now faced with a horrible (and for me, incredible) dilemma. He loves and is devoted to his wife, but he feels his loyalties to the Nawab require that he give his wife to the Nawab. This is MB at its extreme. "If he likes Tameezan, she's his. I think if a friend can't make this little sacrifice, he's no good." The film’s final section is highly melodramatic. Aslam feels that if all else fails, his MB duty requires him to commit suicide. And eventually the Nawab learns, just before his wedding is to take place (to Aslam’s sister), that Aslam’s wife is the woman he wants. To heighten the dramatic tension, the presentation moves into parallel action, with scene switches back and forth between the preparations for the wedding ceremony and anguished activities elsewhere. I’ll leave it to you to watch the film and see how it all ends up. Despite the outlandish and improbable nature of Chaudhvin Ka Chand’s plot, there are a number of things I like about the film. In particular, I liked how the film took on the problematic nature of the purdah practice and demonstrated how keeping the visibility of women hidden from their potential fiances is a fully dysfunctional practice, even when everyone is trying to play the game according to its crazy rules. The party song (mentioned above) about why and how women wear veils. The song at Aslam’s wedding featuring Johnny Walker’s (Shaida’s) extravagant dancing and horn-tooting. 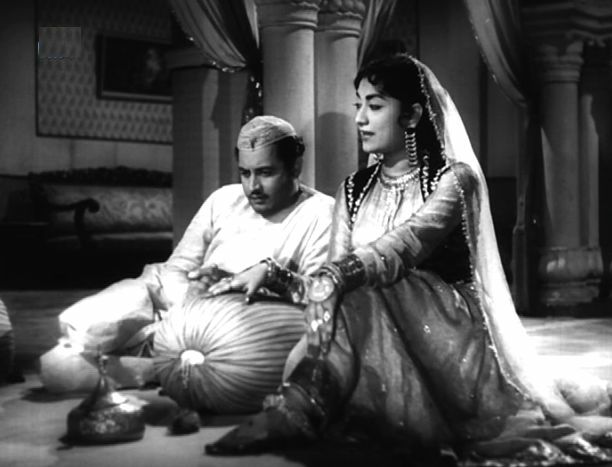 Two songs at separate points in the film by the nautch girl, Tameezan. Jamila’s sad song when Aslam starts coming home late – “my master seems to have changed”. The titular “Full Moon” song, which was the best of all of them . In addition some of the performances were memorable. Guru Dutt and Johnny Walker present engaging characters who are good-hearted and well-intentioned, despite being hamstrung by social conventions of male-bonding. 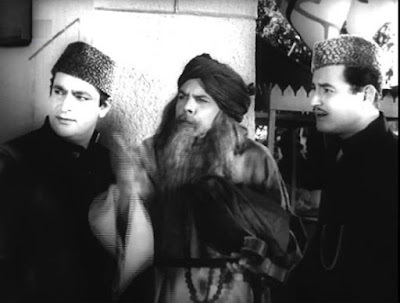 However, the Nawab character, as played by Rehman, was hard to take throughout. When he is satisfied, he comes across as a person mostly devoted to striking self-satisfied poses (happening upon a picture of the Nawab early in the film, Jamila observes, "he probably thinks no end of himself"). Otherwise he is overbearingly selfish and presumptuous. 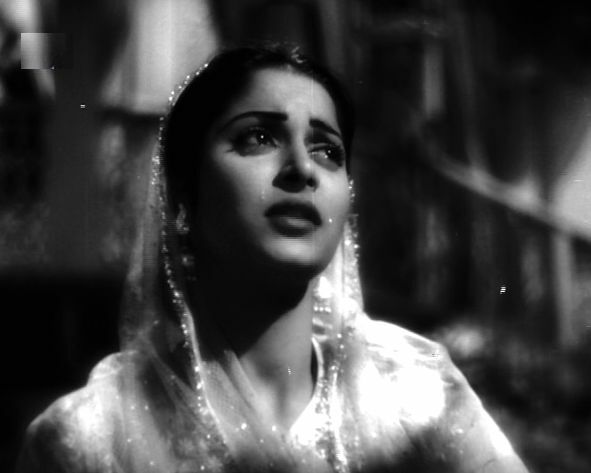 Though Waheeda Rehman doesn’t have a lot of room to maneuver in this story, I thought her performance was particularly moving. Her sensitive expressiveness demonstrates, more effectively than a doctrinal tract on the subject, that women should not be hidden behind a veil. 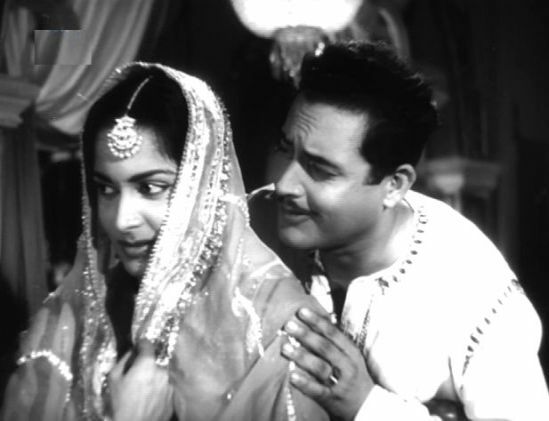 With color films starting to become popular in mainstream Indian cinema during the late 1950s, Dutt had the title song and one of the nautch girl dance songs reshot in color. The version of Chaudhvin Ka Chand that I saw, however, was entirely in black-and-white.